Special thanks to Melinda and Alex. I’m a sucker for a weekday happy hour, especially when it takes place near my office downtown and I can still walk home during the last moments of daylight (thanks, Daylight Savings Time). 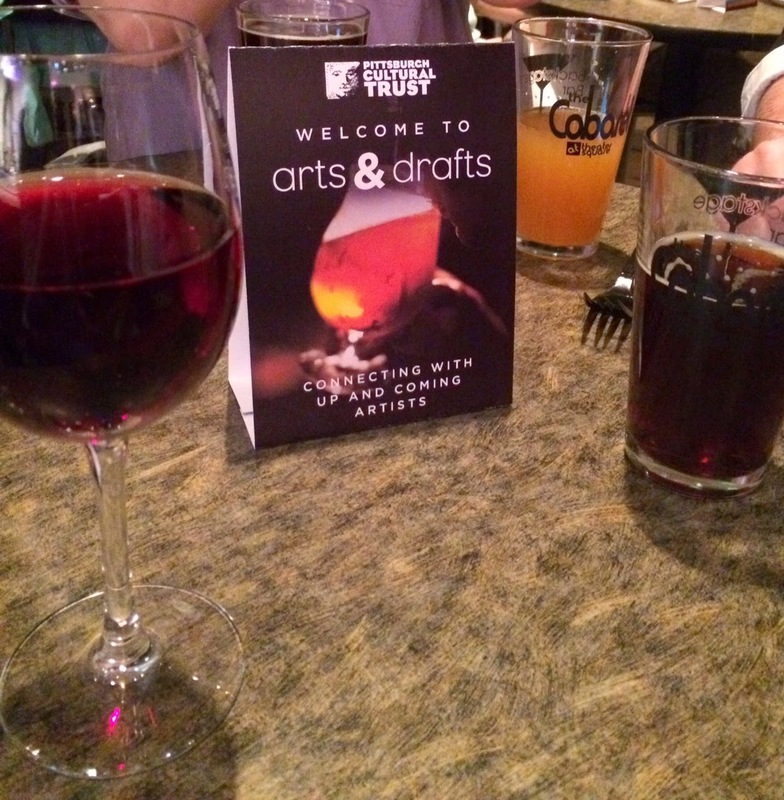 This Monday, the Pittsburgh Cultural Trust hosted the first happy hour of a new series called “Arts & Drafts.” These happy hour events are meant to connect people with up and coming artists, with proceeds benefiting the organization. The purpose of the event is to help people realize downtown Pittsburgh as a vibrant work-play destination. Arts & Drafts admission cost $25 per person, and I purchased tickets in advance online anticipating a sell-out (for this night, there were some tickets still available at the door; I don’t anticipate that happening again). Held at The Cabaret at Theater Square, the ticket price included light bites and two free drafts (or cocktails, for those of us non-beer drinkers) AND a one-year Partners membership to the Cultural Trust (which can get you discounts at future shows and other member benefits and invites to other cool parties (and I’m pretty sure I received some other “freebies” coupons in my membership packet). The space was immediately energized from the lively electronic-meets-jazzy local group Beauty Slap – a trombone and trumpet quartet complemented by a lead guitarist and DJ-like production and mixing. 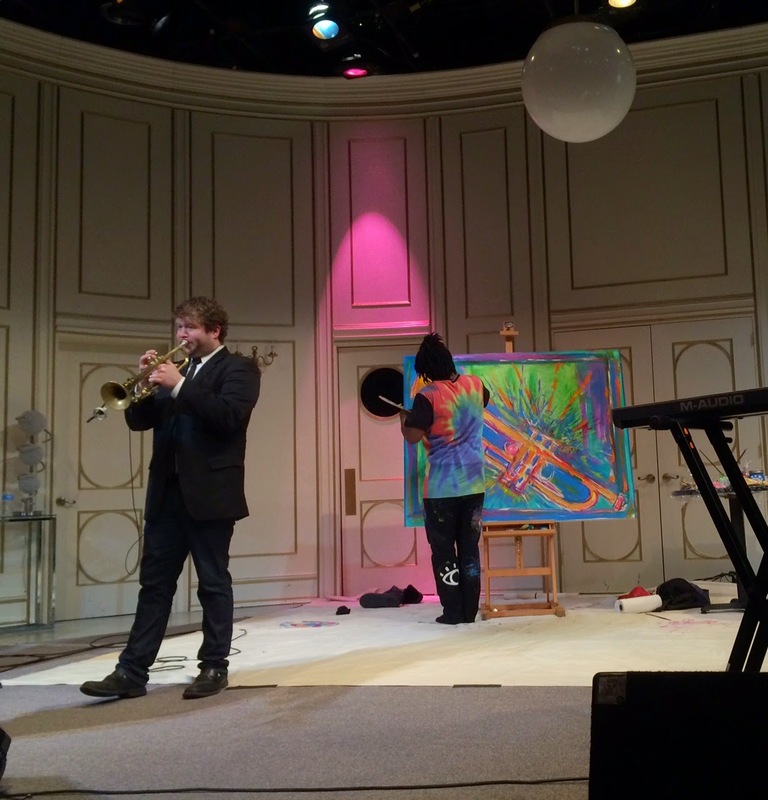 Even more awesome: while the band played, live art was created on-stage in the background courtesy of Baron Batch – an impressive and colorful piece was later raffled off to a patron. Batch also spontaneously painted one of the musician’s jackets. These two elements together (and you know, the “drafts” part of the theme) made for a seriously fun happy hour. The Cabaret space is great for this type of event too, aside from having to get my drinks at the bar. Tables were set up around the perimeter of the space with a substantial place for dancing in the center – too bad the crowd didn’t use it much until the encore. Don’t get me wrong, I was definitely thinking about dancing. But you know, Mondays. Appetizers were provided by Mad Mex and looked to be heavy on the salsas but there were a few other chafing dishes of food available; unfortunately, I was preoccupied with redeeming my drink tickets among the crowds gathering at the Backstage Bar and pretended not to see the growing buffet line behind me. Maybe a better placement for the food next time? I look forward to checking out upcoming A&D events to see how well the Trust combines art and music (and, naturally, the drinking) for growing its membership base. Links to other #pghGBE posts below! Baron is the best! Glad he stayed in Pittsburgh or things like this. We are lucky to have him. Happy April Fools yinz!